If you have any questions regarding the proper way to prepare and cook the Paleo-friendly spaghetti squash, look no further. I have posted a recipe that includes how to make spaghetti squash before, but here I cover the process with more detailed step-by-step photos, with a bonus recipe at the end. 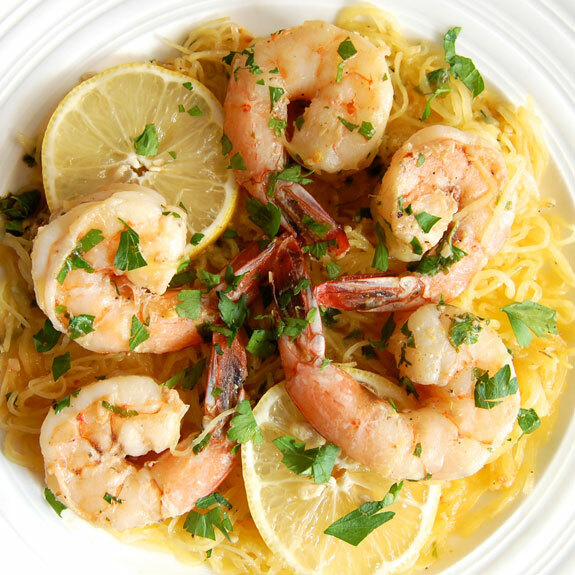 The shrimp scampi recipe can be prepared quickly to make a delicious weeknight meal, and therefore is one of my most-used recipes with spaghetti squash. When picking out a squash at the grocery store, you do not necessarily reach for the largest one. 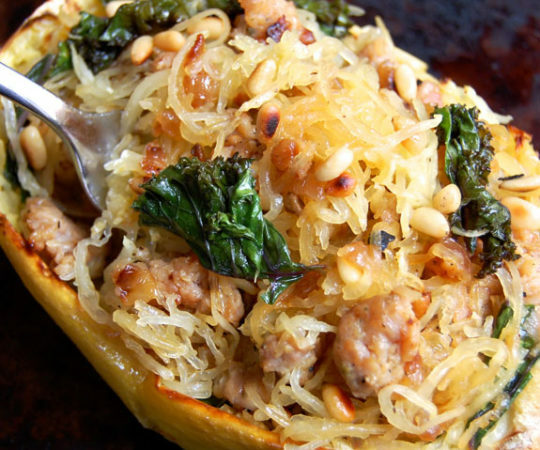 One small spaghetti squash can feed about four people. Instead, focus on picking out a squash that has a rich yellow color to ensure ripeness. To prepare the spaghetti squash, you place it in the microwave for 3 minutes or so to make it easier to cut into. Some people just microwave the squash to cook it entirely, but I believe that roasting it in the oven is the best way to cook it. To open up the squash you carefully cut it in half lengthwise using a large, sharp knife. 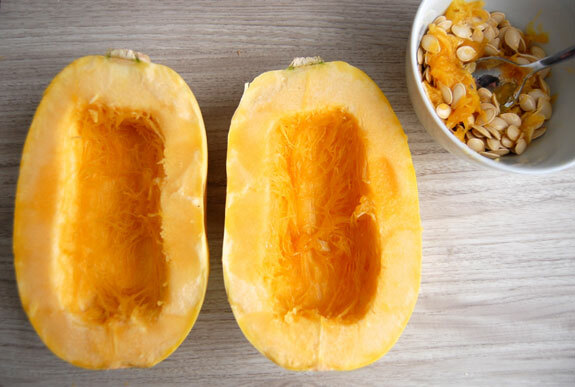 The seeds should be scooped out of the squash with a spoon, similar to a pumpkin. 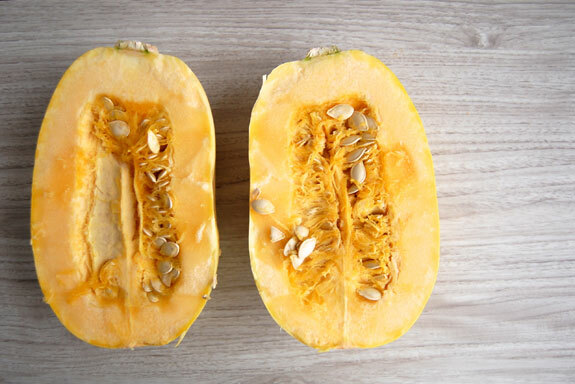 Also similar to a pumpkin, the seeds can be preserved and roasted if you like. After scooping out the seeds, you drizzle the squash halves with olive oil and any desired seasonings, place on a baking sheet, and roast for almost an hour. 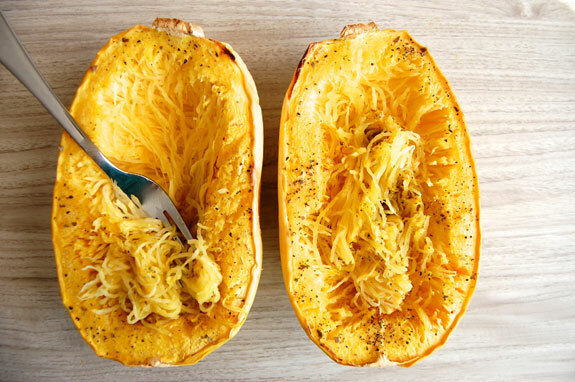 Once the squash is soft and can be poked with a fork, you can shred the insides to get the spaghetti-like strands that the squash is named for. You might want to wait until the squash has cooled down enough to handle, or you can use an Ove-Glove, which I secretly love. I like to make spaghetti squash about once a week because I can do so much with the roasted squash. One night I can make it with pesto, the next night as a slightly more elegant meal in the form of shrimp scampi. The shrimp scampi takes under twenty minutes to make. This bright and lemony dish is perfect for cold wintry days. 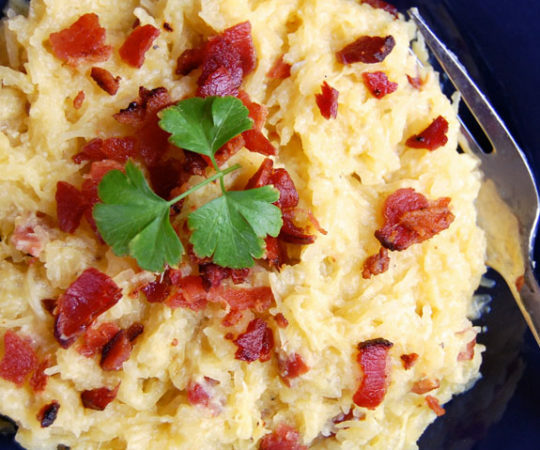 Mix the spaghetti squash into the buttery sauce for a delicious and filling dinner. Preheat the oven to 400 degrees F. Place squash in the microwave for 3-4 minutes to soften. Using a sharp knife, cut the squash in half lengthwise. Scoop out the seeds and discard. Place the halves, with the cut side up, on a rimmed baking sheet. Drizzle with olive oil and sprinkle with seasonings. Roast in the oven for 45-50 minutes, until you can poke the squash easily with a fork. Let it cool until you can handle it safely. Then scrape the insides with a fork to shred the squash into strands. 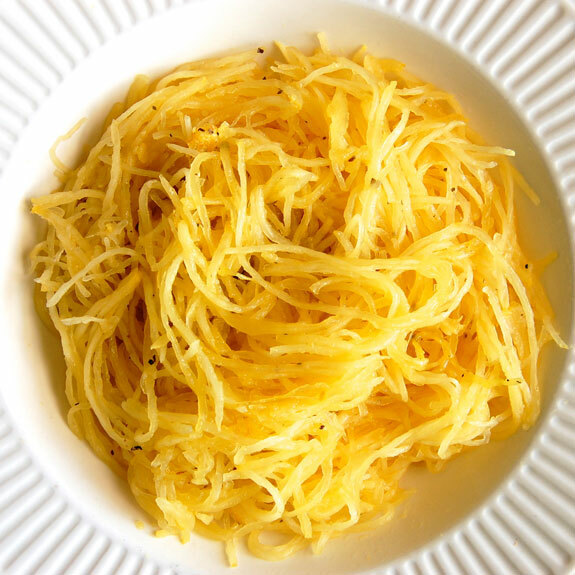 After removing spaghetti squash from the oven, melt the butter and olive oil in a skillet over medium heat. Add in the garlic and sauté for 2-3 minutes. Then add in the shrimp, salt, pepper, and a pinch of red pepper flakes. Cook for 5 minutes, until the shrimp is cooked through. Remove from heat and add in desired amount of cooked spaghetti squash. Toss with lemon juice and zest. Top with parsley to serve. Stumbled across this and happened to have everything On hand to be able to make for dinner tonight. It was fabulous! Even the picky eating kids ate it! That’s great! 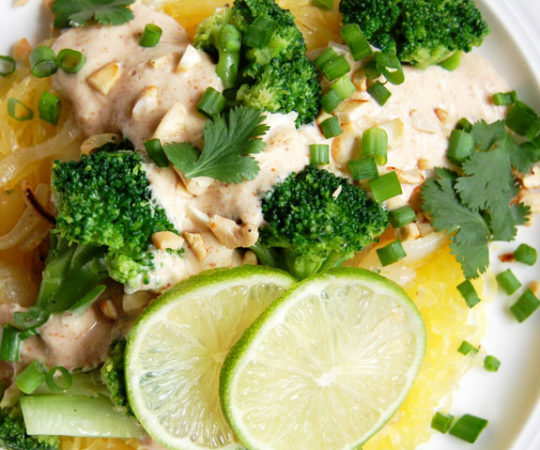 It’s always great to discover Paleo-friendly recipes that kids can enjoy as well! Found this recipie today delicious!I added arrowroot powder to thicken the sauce and garlic powder to make it more garlicky! Thanks for the suggestions Natalie- always feel free to add your own twist to the recipes! I’m eating it right now! Yummy! Love the flavor and freshness of the squash! Do you use this amount of sauce for the full squash, or for half of it? How many servings do you get out of one recipe? Thanks! This is really yummy! Would definitely make it again! Made this tonight! Very tasty! My squash exploded at the 2 minute 30 second mark in the microwave! I’m thinking it was because it was pretty small. I believe its salvageable so am pressing on. This looks so delicious! Omgosh! This was so good. We live in the south so I added a good bit of pepper and added onion & garlic powder to it as well. My picky 2 year old gobbled it up. Great recipe for Lenten Fridays here in the south! Thank you so much for this recipe. This is my first time ever having spaghetti squash. Where has it been all my life?! I can see my self using this not only as a noodle replacement but also as hash browns. I will never crave simple carbs again!! My kids gobbled the shrimp scampi up and my youngest keeps asking for more noodles lol. The hubby works late so I had to make him a plate before the kids ate it all. So delish!!! 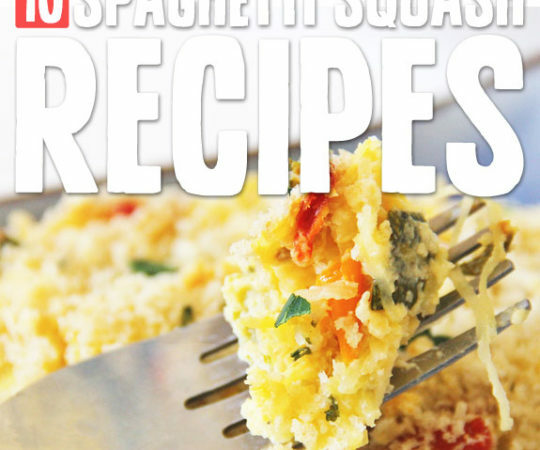 While looking for a spaghetti squash recipe I came across this one. I happen to have everything for this dish & it came out great. Very tasty & quick (I had baked the squash the day before). I have been very curious about the paleo diet. This was a nice intro. Thanks. Tried this but how do you get the squash to shred. I tried it warm and cold but both times it just went to mash. Any advice? Are you sure you bought a spaghetti squash and not a regular squash? The spaghetti squash is oval and yellow. It ONLY shreds. Made this tonight. It was wonderful. My hubby is not a vegetable lover and he really liked it. This is a keeper. Thanks so much for the recipe.